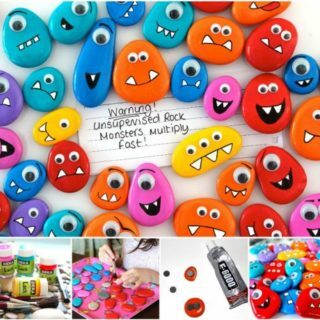 Have you ever had those days with your kids where they’re suddenly desperate to craft but you weren’t prepared and now you feel like you don’t have any neat supplies left, so you have to get creative? Perhaps you actually just love the idea of making cute trinkets with your kids that you can put on display but that are quite permanent and will actually last. 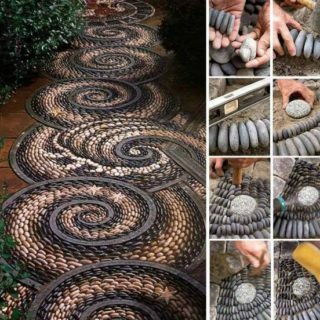 Maybe you’re the one with the crafting craving and you just really like adding elements of the natural outdoors to your home whenever you can? 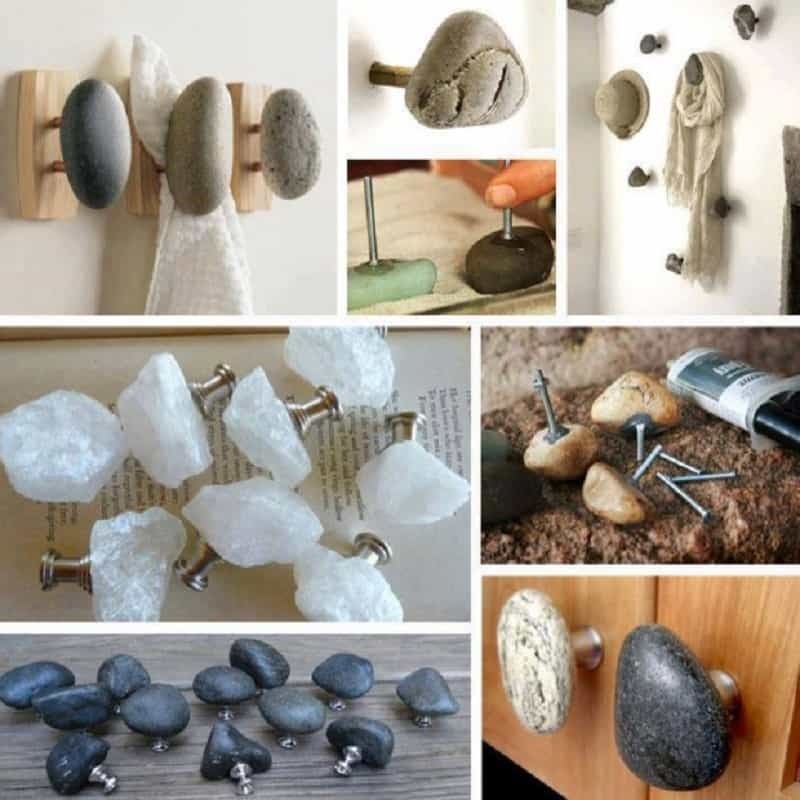 In any of these circumstances (and more), getting creative with rocks and stones is an awesome idea for you! 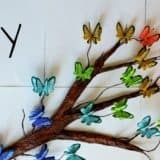 Check out these 15 fun DIY projects and tutorials that will help you use fun, natural, and unconventional crafting “tools” right out of your own garden. Do you love the idea of having greenery and plants in your little apartment, but you work so much that you know you won’t have time to take care of them? 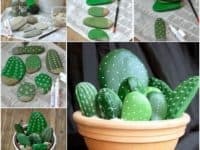 Have you always loved how cacti look planted all in one pretty display together but you’re worried that your kids or your cat will hurt themselves on the prickles? 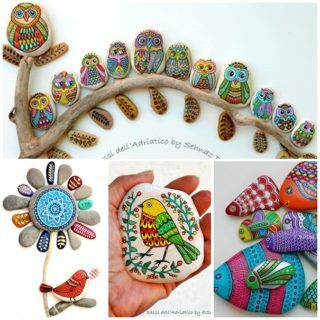 Then check out this cute and creative alternative from Fab Art DIY! 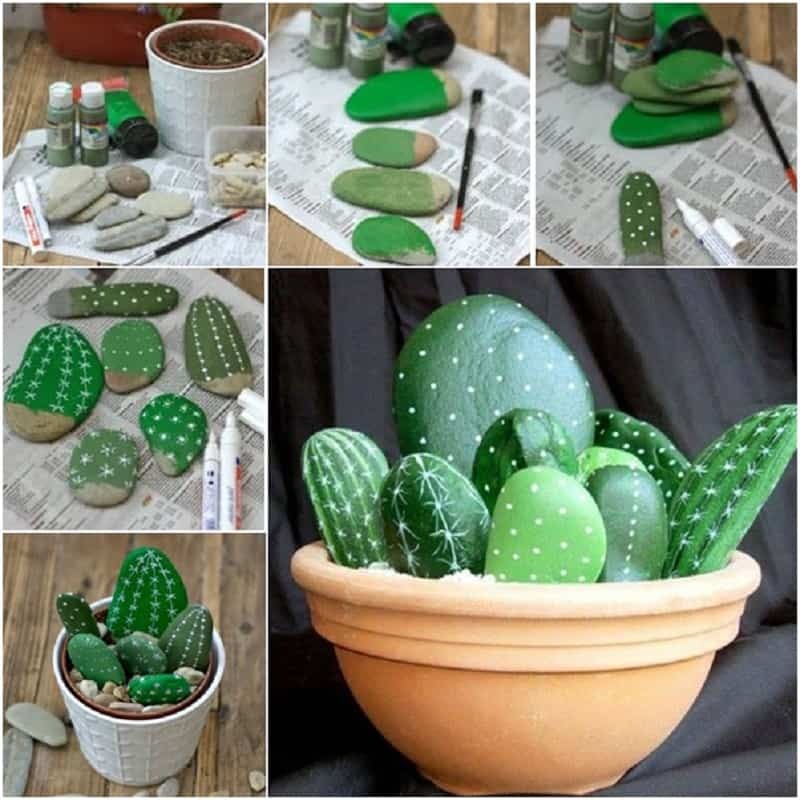 We love that making your own painted rock garden is like a double craft because you get to paint each actual “cactus” but the you also get to arrange all your rocks to your satisfaction. The best part? They’ll never die! 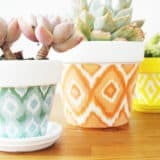 Perhaps you actually do have some real plants but those regular old terracotta planters that are so common in stores have just never really been your style? We can totally understand wanting something that’s a little more natural and neutral in your yard, especially if your plants or flower arrangements are more on the understated side. 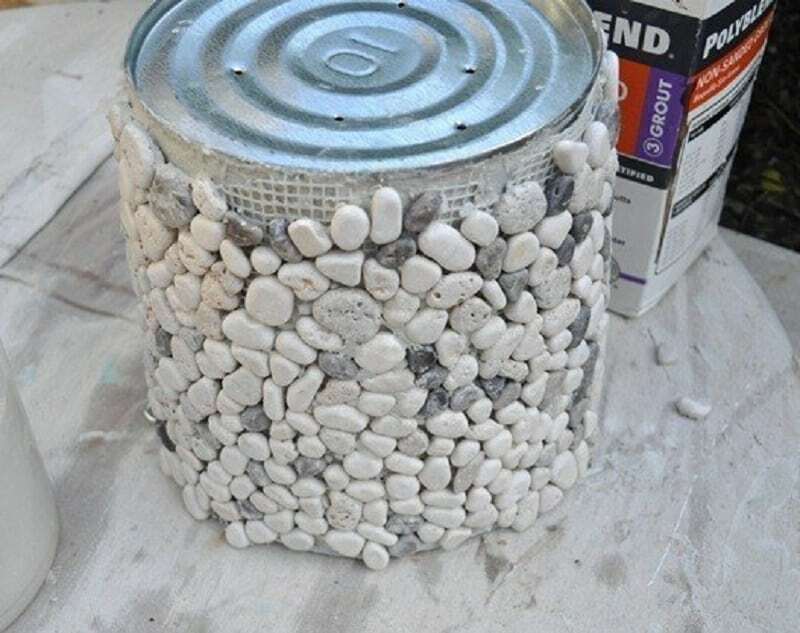 That’s why we like this pebble planter idea from Pic Photo! 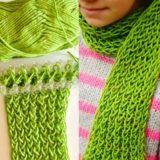 Their tutorial guides you through every step of the process to make your own in any size. Do you love the pebble mosaic look on the planter above but you’d actually prefer to bring that look inside and have it incorporated into the small details of your décor? 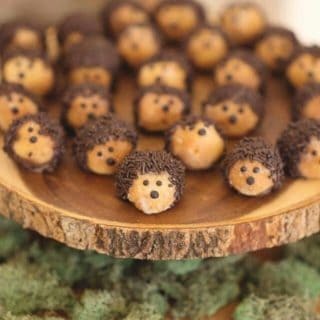 Then take a look at these adorable little projects by Dollar Store Crafts! 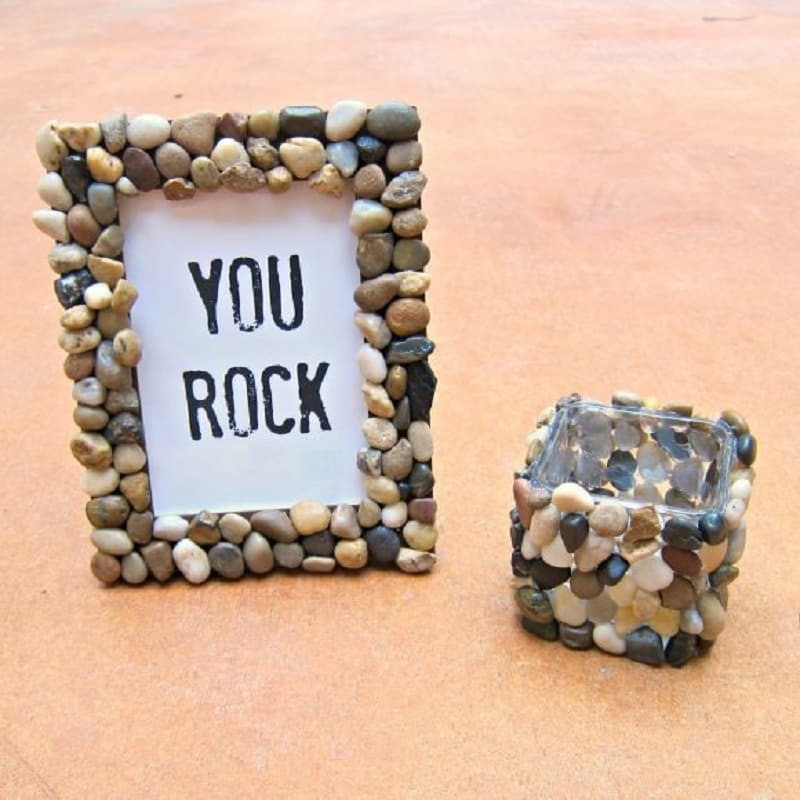 They show you a method of affixing rocks to simple premade things that will allow you to customize all kinds of frames, storage jars, and more! 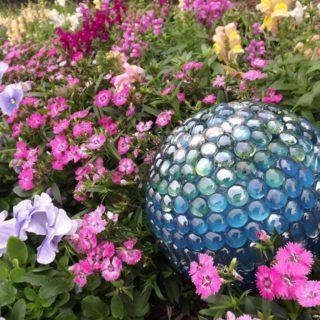 Have you always loved the looks of precious gems, crystals, and natural rocks with stunning inner layers look but you don’t have the budget to buy such whimsical decorative trinkets and you’ve never been lucky enough to find any in your backyard? 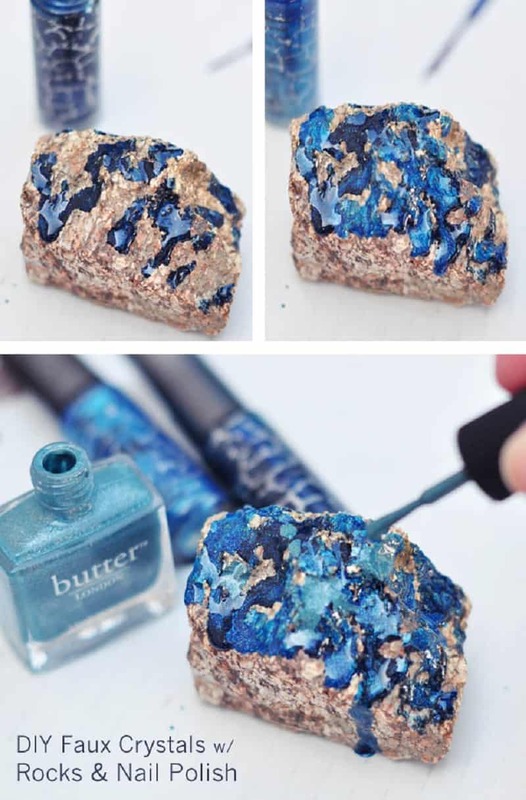 Then check out how Pic Photos brilliantly faked it using a regular nice rock and some pretty nail polish! 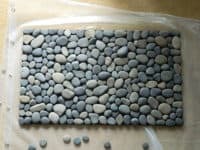 Your Amazing Places guides you through the process of making rock and pebble wall hangers that will make your entryway, bathroom, or any other room look like a relaxing spa! 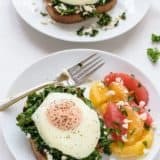 We think you’ll be surprised at how simple their technique is. 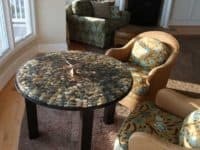 We love the way all different rocks look in this project but if you plan to hang nice clothes, considered polished ones with no jagged edges or corners so that nothing catches and ruins your garments. 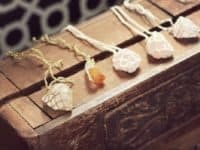 Whether you found the rocks on the beach, purchases them from a natural crystal supplier, or were given them as “gifts” by your kids after their walk home from school, some rocks are just easy to dress up and turn in fancier jewelry than you might expect. 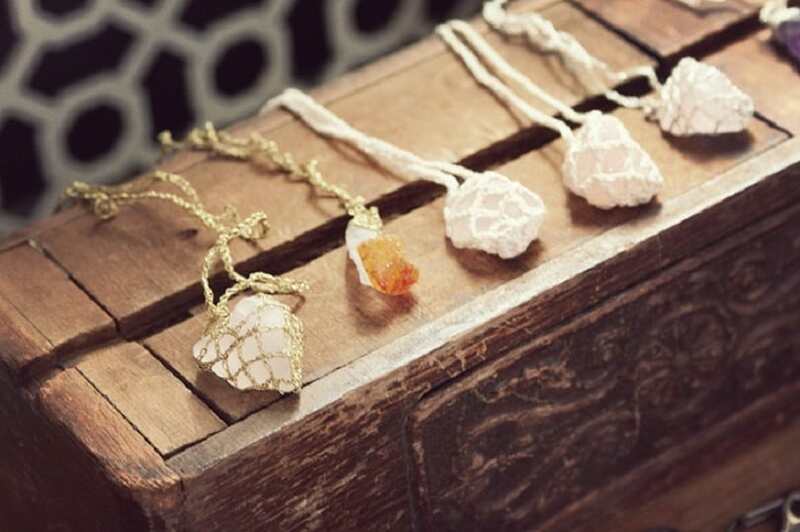 We love the way Bowtie Diary wrapped these rocks in gold jewelry wire or find gold chain to create edgy, Bohemian chic necklace pendants. 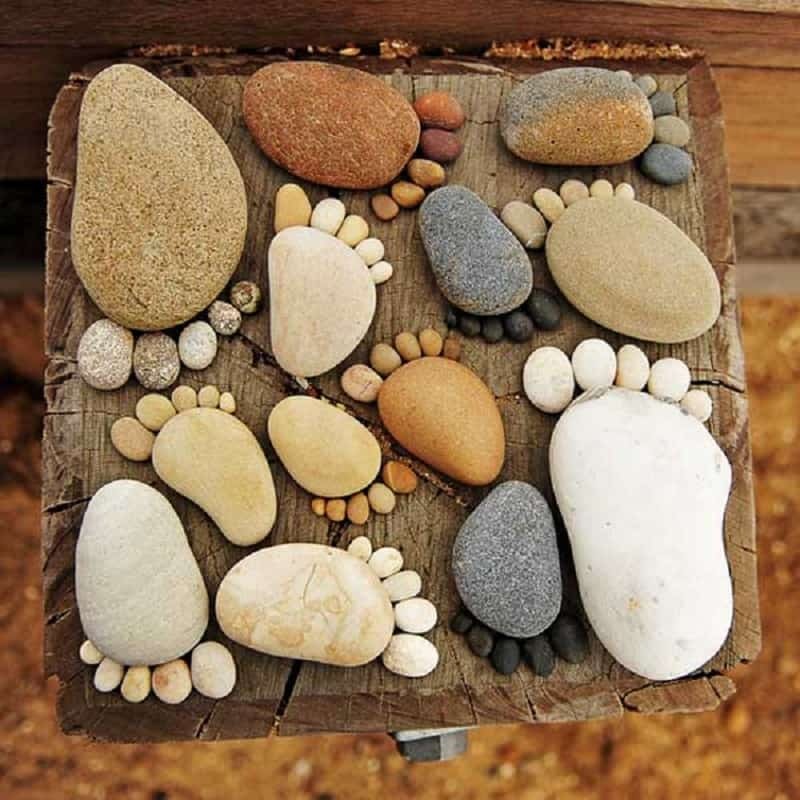 If you’re a huge fan of anything kitschy and adorable that can be put in your garden then we have a feeling that you’re going to love these funny little footprints from Harvest Heart. 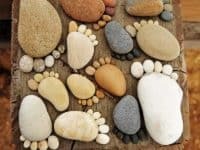 Whether you simply collect the stones with your kids and make them temporarily by laying them together in the garden, or whether you glue them together on a base with one footprint for each family member, everyone who sees them will say “aww”. 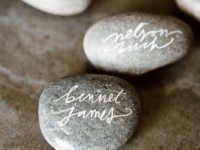 Do you love the idea of rock painting but your mural skills aren’t exactly the ones you’re most proud of, even though you’re quite skilled at hand painting text or doing calligraphy? 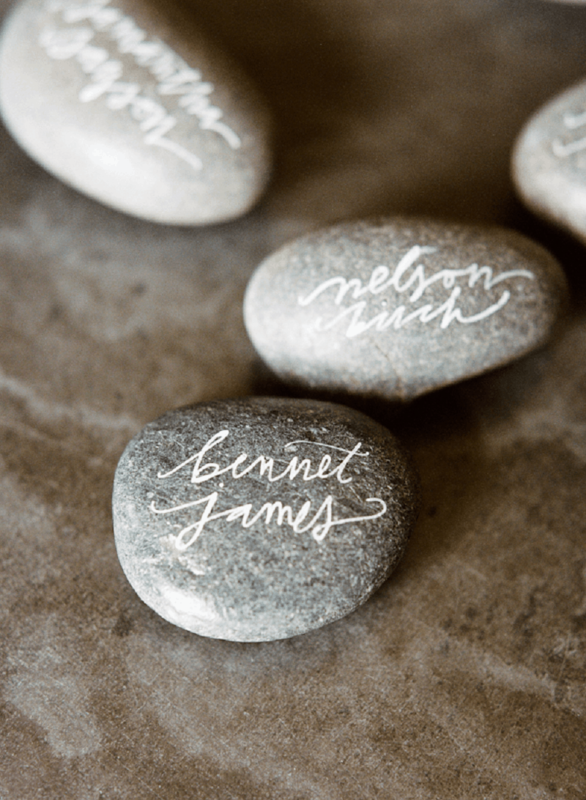 Then use those talents instead and create yourself some polished stone place makers for your next special occasion and dinner hosting event, just like Once Wed did here! People will love them so much that they’ll want to take them home and put their pretty names on the mantle. 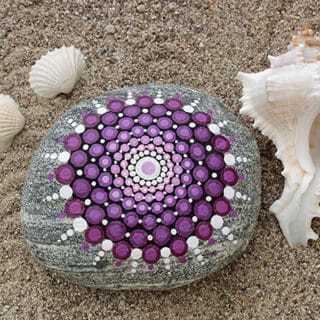 Do you love the idea of actually building small structures from rocks but you’d rather they have some purpose instead of just being decorative statues that you must find homes for amongst your other homemade trinkets? 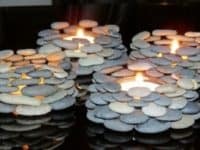 Then take a look at these stacked pebble tea light candle holders from Viral Creek DIY! 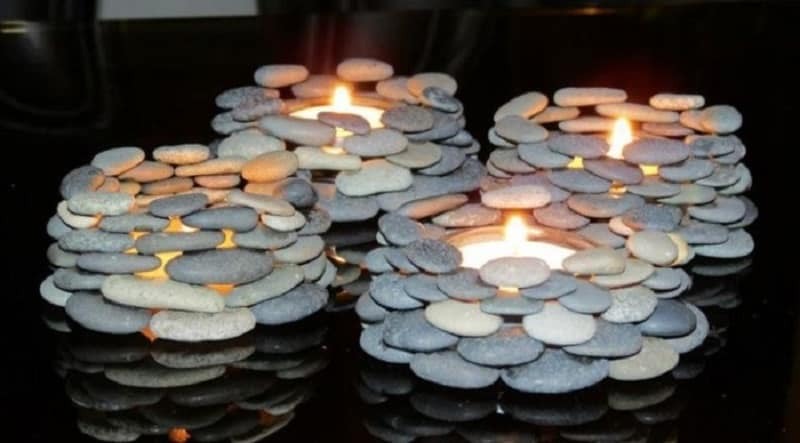 Their tutorial will teach you how to make structures from little rocks and stones nice and concretely so that they stay put and your hard work doesn’t cave in. 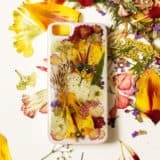 Are you the kind of crafter who is happy to make almost anything you can get your hands on creative and pretty as long as you’ve got some paint and a brush to work with? 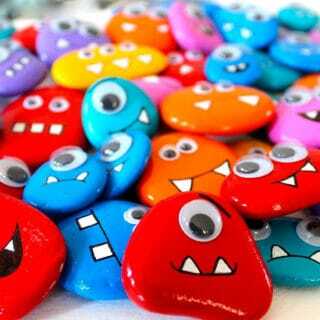 Then stones, pebbles, and rocks are like a never ending canvas for you as long as you’ve still got the time to go outside and get them! We love these simple little décor trinkets from 100 Layer Cake because you can make any doodled patterns you please. 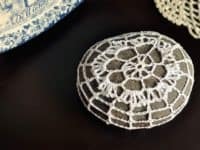 Perhaps you’re in love with the idea of simple decorative rock to use as affordable DIY décor or maybe even pretty paper weights in the office, but things like painting and building have really never been your forte, even though you’re quite skilled at yarn crafts? Then stick to what you’re good at! 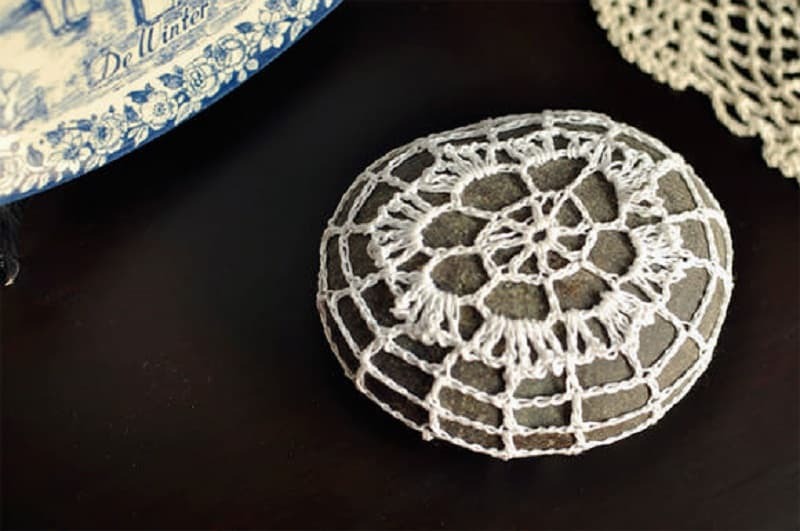 Crochet enthusiasts will appreciate this stunningly delicate lace rock cover idea from Pieces I Enjoy. Keep them all white for a vintage inspired look or create lace covers in all different colours! 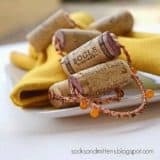 It’s a great way to use up small yarn scraps. 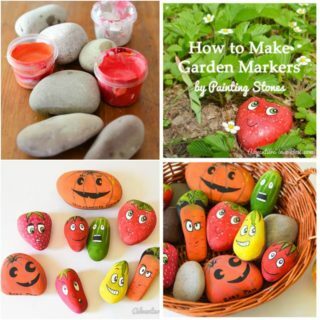 Are you hoping to get your kids in on the fun with rock painting? Then help them make something that they can play with indoors or outdoors, keeping them amused both while you’re crafting and afterwards! 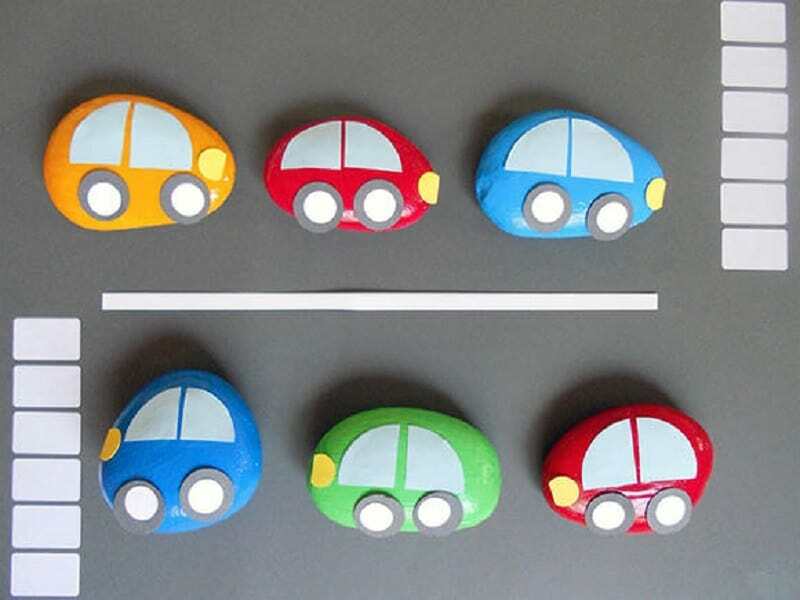 We love these adorable little painted car rocks from La Casa de la Maestra Valentina. 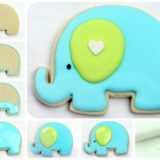 You could make them in all shapes and sizes but we think these rounded ones that look like little Volkswagens are pretty darn cute. 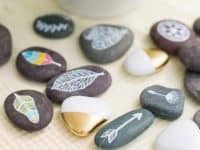 Maybe you’ve been crating with pebbles and stones for a while now and you’re ready to try something a little more challenging than a picture frame or a painted trinket? 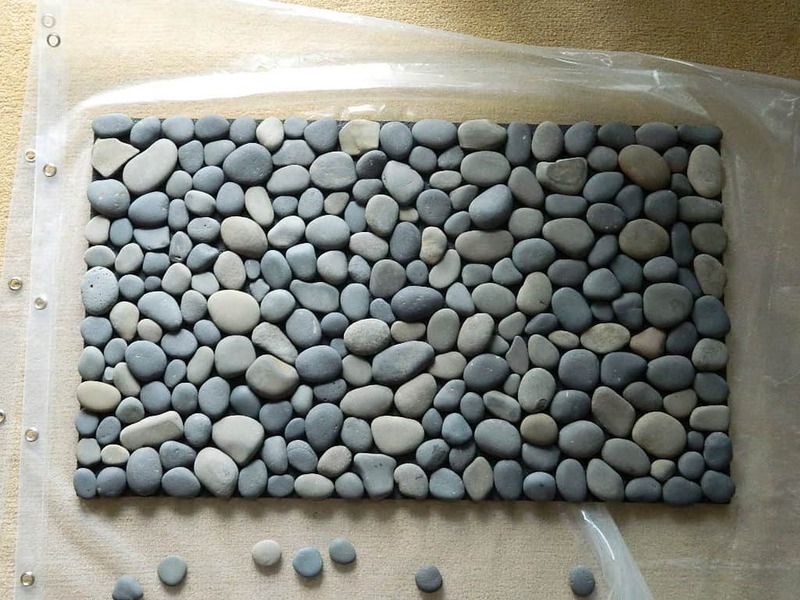 Then check out how Curbly made this breathtaking stone mosaic door mat! Their tutorial guides you through all the materials you’ll need and all the steps you’ll need to follow to make your very own. It’ll make a statement to visitors before they’ve even made it past the front door! 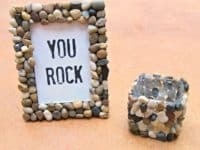 If you’re familiar with working with resin and have some experience making different types of projects with it then we have found the rock project for you! 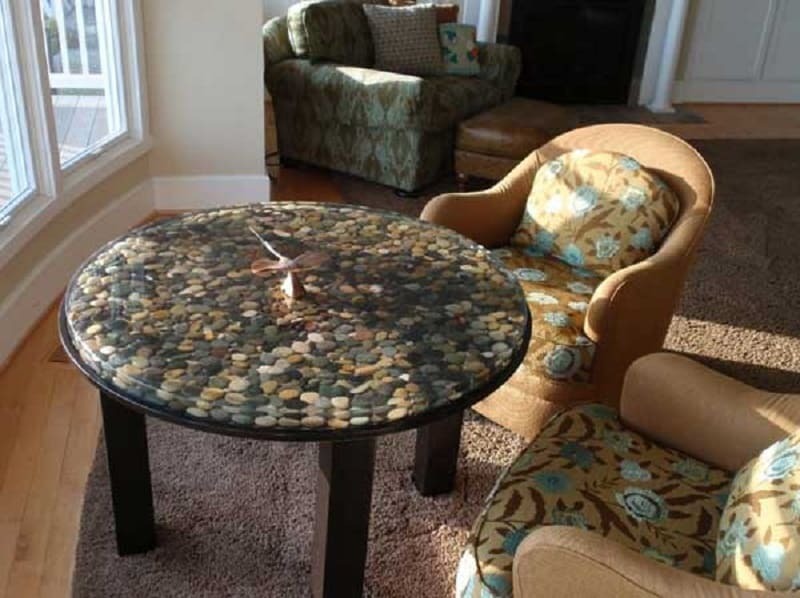 This resin and pebble tabletop from American Bartop has a reflective final effect that makes the pebbles look as though they’re under water or lying at the bottom of a river. Talk about making an awesome natural statement right there in the middle of your living room! 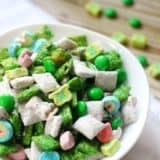 Are you looking for a rock project to make with your kids that will be a little more challenging in order to hold their attention and make them feel very accomplished by the time they’re done? 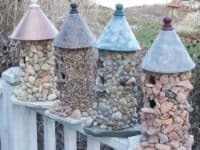 Then check out these absolutely awesome rock bird houses by Architecture Art Designs! These neat towers can hardly be called “houses”, if you ask us. 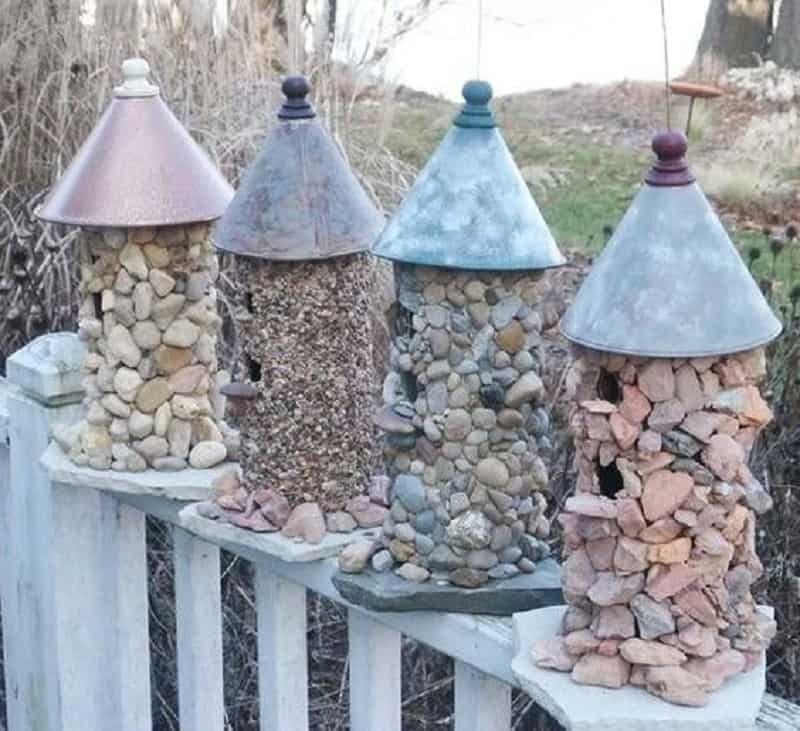 They’re more like bird fortresses and we love that each child (and you) can make theirs look completely different depending on what kinds of rocks and pebbles they choose.